Everything we do relies on causation. We eat and drink because this causes us to stay alive. Courts tell us who causes crimes, criminology tell us what causes people to commit them. D.H. Mellor shows us that to understand the world and our lives we must understand causation. 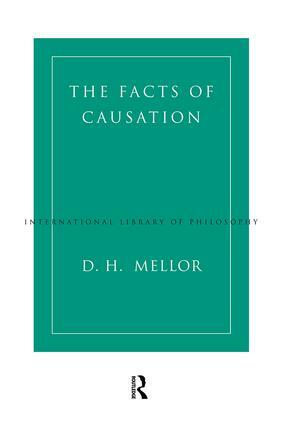 The Facts of Causation, now available in paperback, is essential reading for students and for anyone interested in reading one of the ground-breaking theories in metaphysics. We cannot understand the world and our place in it without understanding causation. Yet a complete account of the nature and implications of causation does not exist. D.H Mellor's new book is that account.